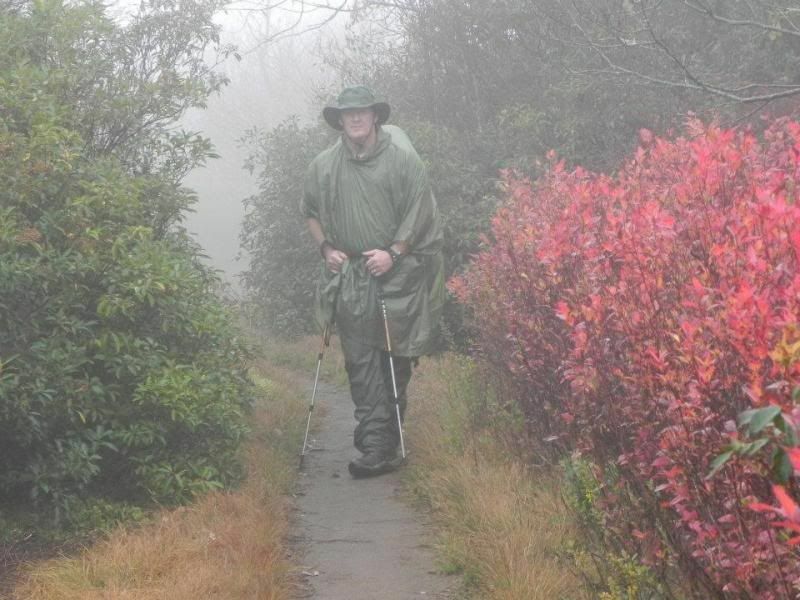 I am using a Golite poncho tarp for the inclement weather with a thin bungi around my waist. I love a poncho as long as it isnt frigid weather and too windy because they are so airy and I dont need a pack cover. I wish I knew what kind of tree that was. I just thought it made a pretty scene. Photo is taken at the top of Spence Field (5000ftelev). I had heard of it for years and it was my first time seeing it. I have never been up there during the leaf change and it was spectacular. Coming up from Cades Cove it is like a 3500 ft of steep climbing so the poles come in handy for sure. I like them for downhills too. I used to just carry one but all of the solo shelters I have now use two poles. Sudden: The field picture is on Gregory Bald, Quite a pretty place. It is home to the flame azalea and I am going to go and try to catch them blooming this June. There are some great pictures of the blooms up there online. All of this grass was a new experience for me as I have only hiked farther north where it is a totally different kind of forest/geology. I googled and found this info. Is this the trail you were on? This whole trip was about sight seeing. We made several side trips and after day averaged about 10 miles per day. Cant wait to go back, but I am planning a 5 night bike tour for march. People say that all the time. Actually, you are up "in the clouds" not down in the fog. If you think about it, it is a nice thought. I am standing up high in the clouds. I am touching the clouds. I like a poncho, too, some have snaps and even webbing with snaps to roll up the extra long length. I use two hiking poles, now, convinced because I wanted to use them for my shelter. The fact is, the hiking poles ease the pounding on my knees on steep descents in the mountains, are handy for balance, and are surprisingly useful. Hiking poles can be helpful for stream crossing, as well. I have even been able to use one model for a monopod for my camera. That looks like a great area for hiking and camping. Last edited by ConnieD on Sun Feb 12, 2012 4:57 pm, edited 2 times in total. That is a typical shelter in the Smokies on the AT. I have not stayed at the Spence Shelter but have several others. Most have a fireplace and Some even have a nice privy. I really enjoy hiking in the Smokies. cadyak: did you get a chance to fish abrams Creek while you were there? Did you have any sunny clear days? Last edited by cadyak on Sat Feb 11, 2012 3:14 pm, edited 1 time in total. Fly-fishing gives advantage to the fish. Ridgerunner wrote: That is a typical shelter in the Smokies on the AT. I have not stayed at the Spence Shelter but have several others. Most have a fireplace and Some even have a nice privy. I really enjoy hiking in the Smokies. It is no wonder most hikers want to get to the shelters. It's a Ramada in the wilderness That's really roughing it!!! No doubt they have steel rings in the walls for hammocks. Located in the corners hahaha, I envision them hanging three high Ladders provided for entry to upper hammocks. Sorry; no hammock rings in the shelter but I have seen one rigged up inside a shelter; with all occupants permissions, of course.